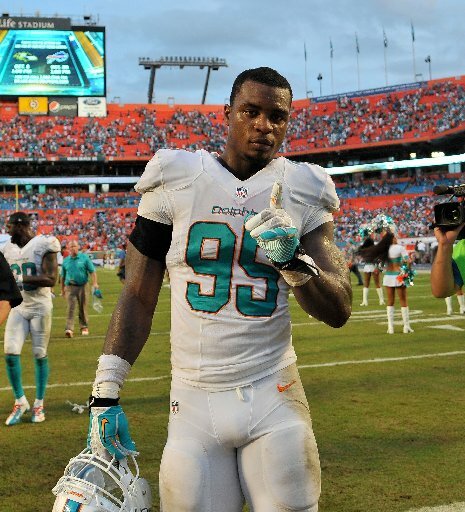 Dion Jordan is a professional football player who plays defensive end for the Miami Dolphins. He was a two way standout on the Chandler High School playing defensive end and tight end, and was a highly regarded prospect despite missing most of his senior year due to injury. His career stats included 67 catches for 1,096 yards and 16 touchdowns, while on defense racking up 76 tackles and 8 sacks. His senior season was cut short when he suffered burns from a gasoline accident. Despite his injuries, he was highly recruited and decided to play college football for the Oregon Ducks. He redshirted his freshman year recovering from his injuries. During that redshirt season, he focused on defense. As a redshirt freshman earned playing time at defensive end, and eventually became an anchor of the vaunted Oregon defense. He played in four BCS bowl games during his Oregon career - the 2010 Rose Bowl, 2011 BCS National Championship Game, 2012 Rose Bowl, and 2013 Fiesta Bowl. His career stats included 121 tackles, 29 tackles for loss, 14.5 sacks, and 4 forced fumbles. Dion's outstanding Oregon career had NFL teams clamoring to draft him. He was drafted as the 3rd overall pick of the 2013 NFL Draft by the Miami Dolphins.